The first, unlucky , person to have been infected and changed is Peter Parker aka Spider-Man. He was bitten by a radioactive spider. Not that bad as spider bites are more annoying than anything. In another way, it’s the radioactive aspect of the spider is where the transformation hinges on. 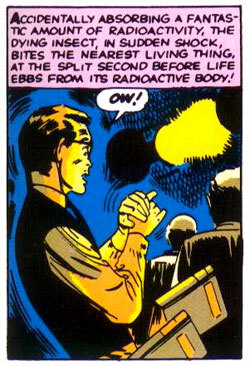 We are only told that the spider has absorbed “a fantastic amount of radiation”. How much is a fantastic amount? Is that an Imperial fantastic amount or a metric one? Nothing bad happened to Peter. He didn’t lose his hair in clumps or being violently sick as the radiation surges through his veins. Not only that but afterwards suffering from cancerous growths. So let’s look at what should have happened instead of believing what Stan Lee told us. This is now where this blog goes away from it’s usual style. Making things up as I go along and hoping that my dubious memory is correct. I’m going to do some research for this and the rest of the characters mentioned! Back to Peter and what should have happened. To have that much radiation surging through your body to re-write your entire DNA to give you the abilities of a spider without taking on the look of one. That’s something that didn;t happen with Jeff Goldblum in The Fly – he got the worse of the transformation. It seems that DNA can be changed with a radiation does from about 50 rem [ or ½Sv]. That’s classed as a high dose. However, that’ll only be a small DNA change and not an, almost, re-write of the genetic code to give the body the ability of a spider but without altering the bits that make you look like one as well. It must have been special radiation of such a high does that it just alters your DNA and not produce any horrible problems. If a high does of radiation is ½Sv then a fantastic amount would be 3 or 4Sv? Otherwise known as a “Usually fatal does”.